Trampoline fitness is an area that many people may not consider for part of their exercise routine. You have probably seen the large trampolines in many backyards and noticed the kids that are having fun jumping on them. You also have seen gymnasts in Olympic competition jumping up and down in various twists and turns. 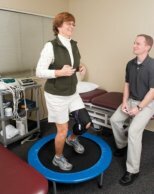 However, you may not have thought about using a trampoline for the exercise benefits you can get right at home. Even regular folk with no interest in tricks and flips can use a trampoline to improve their fitness. One major benefit is that you can work on your cardiovascular fitness. Another great benefit is that this type of exercise is easy on the joints. You may think that you have to purchase a full-size trampoline in order to start, but you can actually buy a mini-trampoline that is portable and can fit anywhere in your home . Space is not a problem. You conveniently move it wherever you feel like working out. The workout itself is very simple. All you need to do is to bounce up and down as vigorously as you wish for about 20-30 minutes. Nothing fancy is required. You can even watch tv as you jump to pass the time. As with any piece of exercise equipment there is a safety consideration. It does take a certain amount of concentration to stay on the trampoline. And you do need to be able to balance fairly well. But since most older adults won’t be doing tricks, at least I hope they don’t, and if you are in okay condition, you can safely benefit from this type of exercise. Using a mini-trampoline for exercise and fun might just be what you are looking for in your routine. Just make sure that you have your physician’s approval before you start. Adding variety to your workout routine can be simple with trampoline fitness.